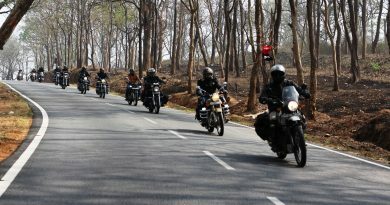 Group Riding is more about RIDING TOGETHER than about Speed, its about RIDING TOGETHER with the Pack!! Its more about the journey than the destination. Group rides have one rider in the front as a Lead/Ride Captain/Head/.. and one rider behind as a last one in the formation as a Safety Man/Sweep/Tail/.. both the riders communicating to each other. Each rider would be adjusting the speed w.r.t the rider in front and behind, by keeping a look in the rear view mirrors and communicating the hand signals. The riders in between are not supposed to move ahead of the Lead and also ride behind the sweep. Head Light Rule: Lights would be ON in low beam throughout the ride. More than the look, it’s a way off communication as in when any light is OFF, which indicates the rider wants to slow down or halt. Communication: The signaling of the riders should be known to each other in advance. All the signals initiated by the lead rider or a rider in front of you have to be communicated to the one riding behind you till the message passes to the last rider in the pack. Regrouping: On long drives we can have some regrouping points normally after crossing villages or cities. There are chances that the formation breaks when you cross a town or a village. Optimum Group Size: Having 8 to 12 riders in a group is good where we have some close formations and bonding. More than that leads to formation brakes, especially when we ride in an unfamiliar group. RULE OF THUMB: End of the ride each rider should get connected or be familiar with the other rider in the pack. 1. Straight line: Best suited for narrow or single lane roads, city traffic, ghats, speed riding, etc. Once you set in your position it would be good if you maintain the position and avoid overtaking unless required. 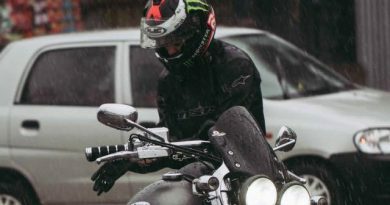 You maintain a safe distance from the rider in front and behind from around 10 to 25 meters depending on the speed. 2. Staggered – Diagonal – Two Line: Best suited for highways or open roads. Ideal for a 6 lane highway. The lead rides on the right side and the second lead on the left, diagonally behind the lead. The speed in this formation is slow compared to the single line formation, but this staggered formation is what group riding is all about. Best is to pick the first lane (at slow speeds, longer formation) or the middle lane (high speeds, shorter formation) when the road is a 6 lane highway, however it can be done on a 4 lane way as well. Two line formation, mostly practiced during a bike rally or a showcase city ride, where the speeds are relatively much slower. 3. Free Ride: Though you have a ride captain and a sweep, simple rule is just not to over take the lead and don’t not fall behind the sweep. In between riders are free to ride at their own pace. Practiced mostly by high speed biking groups. Once you cross 100 kph, your mileage goes down when the carburetors open up. And more than that you would need more focus only on the road and riding with increased strain for longer distances. We also would like to smell roses on the way at times, than just racing towards the destination. Staggered riding is not riding side by side, which is not at all safe!! There should be a sec or two differences between the riders. Switching to a straight line and back to staggered is essential whenever we cross crowded places or encounter traffic. – Riders just need to follow the two riders in front of you in a single file. – Purpose of group riding is safety so that no car or bike cris-crosses the formation. Can be achieved only when the formation is close enough. 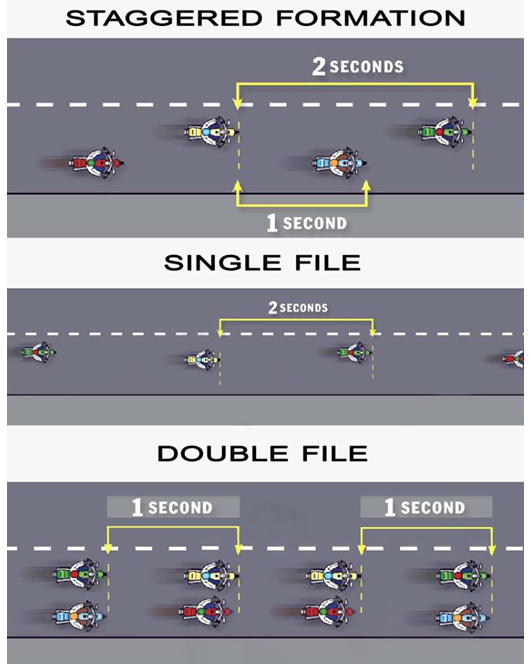 – The spacing between the bikes need to be uniform, in case you slow down, you need to catch up at a bit higher speed to get back into formation. Please keep in mind that there are riders following you and whole group breaks into two if you do not do so. – The vehicles and cars passing us tend or would try riding with us, waving and clicking pics, it is better to wave them to go ahead politely. More details on ride safety, hand signals, etc would be provided during the ride briefing. All riders especially new riders please understand the information communicated to be safe on the road as we ride together. 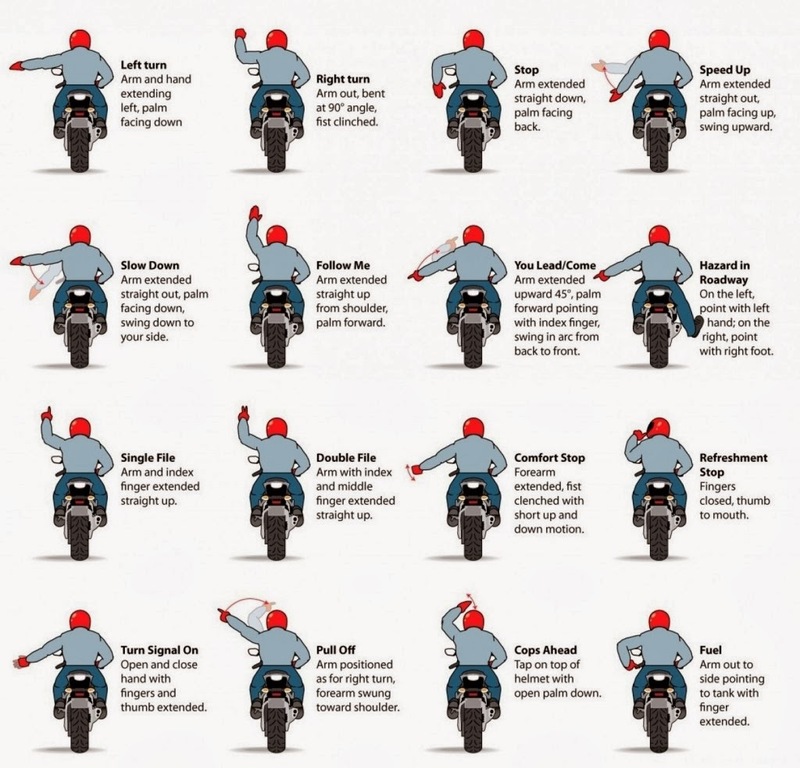 Pass on all the hand signals to the rider behind. This is not only for your safety but for the safety for the entire group as well as others on the road. 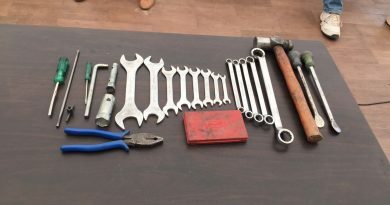 Hi, are these signals valid for gearless scooter? How can I show signal in left hand ?